I remember cutlets being the appetizer that my mom used to make when we had guests over. She used to make vegetable cutlets, fish cutlets, kheema cutlets. They are actually pretty easy to make and beyond delicious. 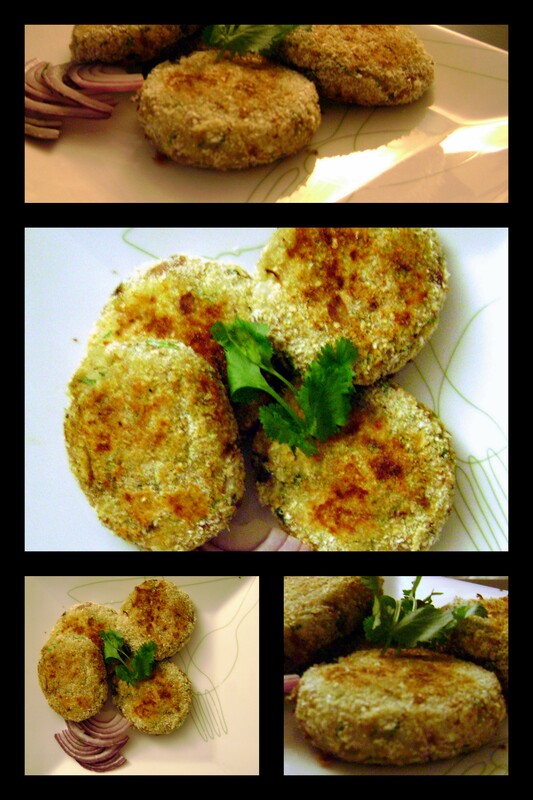 I have made vegetable cutlets before; they are my favorite among cutlets. I bought some tilapia at the grocery store the other day and had plans to fry or roast it for dinner. Then I noticed some boiled potatoes in the refrigerator, and that’s when it hit me, fish cutlets!!! Mom always used to make some extra cutlets for next day. I loved the cutlets the next day (not that I ate any less on the day of the party) because they used to be served piping hot – from the stove to my plate. The fish cutlets she used to make were from the tastiest fish varieties ever – I so long for the fresh fish from the fish markets in Bombay. I guess I’ll have to make do with the tilapia for now. So here’s the recipe for fish cutlets. You can make them even the day before and save yourself sometime on the day of a party. This recipe makes about 12 cutlets. Season the fish fillets with salt and black pepper. Set this aside for a about 15 minutes. Bake the fish in the preheated oven at 350 deg F. Turn the fillet over after about 5-7 minutes. Turn over the fillet once again after another 5-7 minutes. Remove the fillets from the oven after about 3-5 minutes. Shred the fish into small pieces and set aside. In the meanwhile boil the potatoes and mash the potatoes to a smooth consistency. Chop the onions, green chillies and garlic cloves. Heat the oil and when hot add the onions and fry for a couple of minutes. Add the green chillies and the garlic and fry all the ingredients till the onions turn a brown in color. Now add the cumin, coriander powder and fry for a couple of minutes till the ingredients are mixed together well. Reduce the heat and add the mashed potatoes and mix well. Remove the potato mixture from the heat and add the shredded fish, coriander leaves and the lime juice to it. 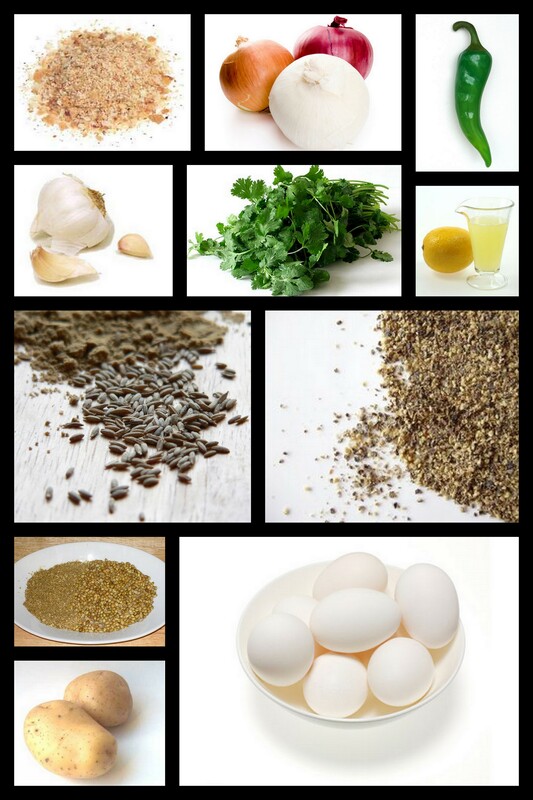 Mix all the ingredients together and ensure that the mixture has a sticky consistency. Make about 12 flat patties out of the mixture and set aside. Make the bread crumbs and set aside. Take each flat patty and apply a little egg on both side and then cover with the bread crumbs. Heat a little oil in a frying pan and place the cutlets in the frying pan. Fry the cutlets till brown on both sides. This recipe takes about 30-40 minutes for preparation and another 10-15 mins for frying. These cutlets can be served with any kind of bread and some people also like some ketchup on the side. Some green chutney would also go well with the cutlets. I made these cutlets atleast 3 weeks back but then had a conference to go to so had to put an hold on the blog. But am back now and will be back to regular postings as before. You can easily substitute the fish with any other, it is not necessary to use tilapia. And the outer crust for the cutlets can be made using a lot of ingredients but I love the version with bread crumbs. You could also use corn meal or semolina. Hope you enjoy making these cutlets as much as my I did. This entry was posted in Appetizers, Fish, Potatoes, Snacks and tagged Cutlets, Fish, Fish Cutlets, Potato, Tilapia. Bookmark the permalink. Good reciepe i am gonna try this one for sure….which fish would be a best substitute for tilapia? You can substitute just about any fish. I would go with a fish like pomfret (black) so that your life is easier, no bones to pull out…. My mom used to make it with fishes with lots of bones as well but that does take a lot more effort cos you have to pull out the bones. Basically any fish which has more flesh and less bones would work. Hope that helps. And do let me know how they turned out when you make them.